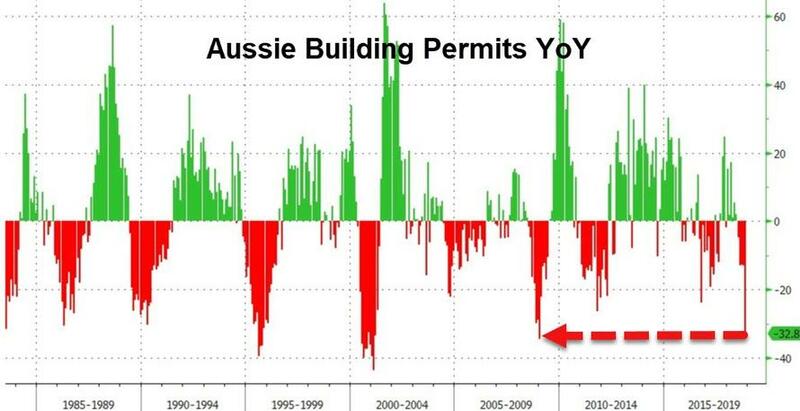 Aussie dollar dropped and popped in early trading after building approvals plunged 9.1% MoM to a 32.8% YoY drop - the biggest decline since Jan 2009 (and dramatically below expectations). 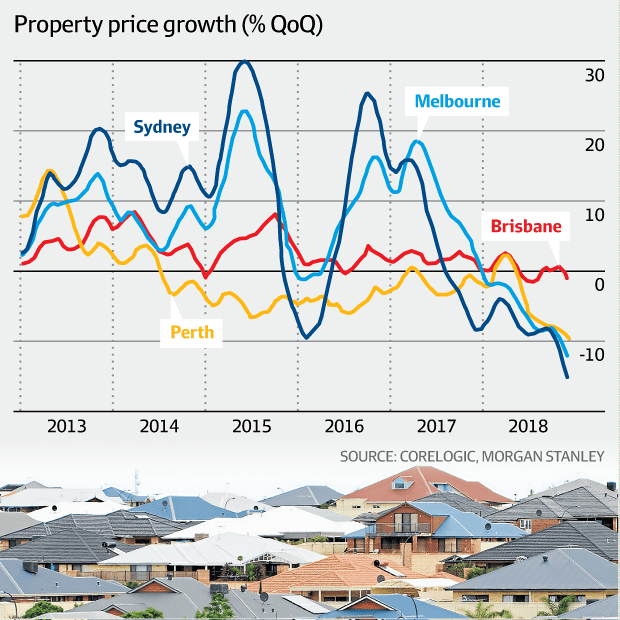 This devastating indictment of the economy down under comes after aussie house prices tumbled at the fastest rate in 35 years, increasing the likelihood of a disorderly market correction and economic recession, according to global investment bank Morgan Stanley. As AFR's Duncan Hughes reports, in the last three months of 2018 Sydney property prices fell by 15 per cent on an annualised basis, followed by Melbourne's 12 per cent,with big falls posted in other major capitals. "With entrenched weakness across all aspects of the market, 2019 looks unlikely to hold an improvement," warns Daniel Blake and his team of Morgan Stanley analysis. "Focus is now on the broader economic impact of the ongoing correction. Further details continue to suggest a sustained deterioration in conditions, with few signs of a turnaround," the report warns. House prices slid another 1.3 per cent in December, the largest monthly correction since 1983, and falling property prices and weakening consumer sentiment are expected to have knock-on effects across the economy, particularly in the struggling motor industry and retail sector. "We expect the wealth effects we have already seen on high value items, such as car sales, to exert themselves on broader consumption spending over 2019, as households focus on deleveraging in an environment of declining asset prices, elevated debt levels and still low wage and income growth," the analysis warns. “Australia’s housing market is a source of vulnerabilities due to elevated prices and related household debt. A direct hit to the financial sector from a wave of mortgage defaults is unlikely,” the report says. The Paris-based global forum recommends the Aussie Reserve Bank begin raising the cash rate from its record low as soon as possible to prevent “imbalances accumulating further”. Notably, OECD's ominous warnings come after RBA deputy governor Guy Debelle raised alarms (after Q3 GDP dramatically undershot expectations at just 2.8%) by suggesting the next move in rates could be down, not up, and floated the possibility of controversial money printing policies known as quantitative easing in the event of a crisis. As John Rubino recently noted, for the past few years, homeowners just about everywhere have been able to finesse life’s problems by thinking “at least my house is going up.”... But now that’s ending, and a reverse wealth effect is kicking in. Homeowners are seeing their home equity – aka their net worth – stop growing and in some cases drop by shocking amounts. In Australia it’s $1,000 a week, which is enough to darken the mood of pretty much anyone not in the 1%. A consumer with a dark mood is an unenthusiastic shopper because new debt accelerates the decline in net worth. As home prices fall, so therefore does “discretionary” spending. Australians will continue to eat and to air condition their bedrooms, but they’ll cut way back on vacations, new cars, etc. And the debt-based part of the economy will suffer. This will cause stock prices to fall, knocking another leg out from under the average citizen’s net worth and making them even less likely to splurge. And so on. Credit-bubble capitalism depends on mood, which makes it fragile. That fragility is about to be on full display pretty much everywhere.